Hobbs Tuscany Bleached 100% Cotton Batting is especially designed to give a soft hand and an even appearance in light-colored quilts. Exceptionally easy to quilt by hand or machine, it is one of the softest cotton battings on the market today. Made with only the finest cotton fibers, this clean, bleached, long-staple, virgin cotton batting proudly displays the Cotton Incorporated Seal. Containing no scrim or binders, this 100% bleached cotton product is needle punched to resist bunching and shifting. Hobbs Tuscany Bleached 100% Cotton Batting is a soft, thin, low-loft batting, made with the finest clean, bleached, long-staple virgin cotton available (and proudly displays the Cotton Incorporated Seal) – it resists bunching and shifting and is well-loved by those seeking to keep their white or light-colored quilts nice and bright. 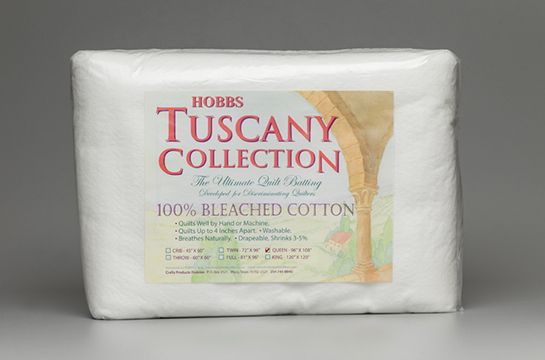 Hobbs Tuscany Bleached 100% Cotton Batting may be stitched up to 4″ apart, and it is machine washable (once inside a quilt), with the batting becoming softer and softer after each washing, and shrinkage of 3-5% expected. We recommend quilters spend time learning about Hobbs Tuscany Bleached 100% Cotton Batting before using it on a project – making samples using this batting to see how it needles, both by hand and by machine, and how it launders, provides an opportunity to see if this batting can deliver the desired results.